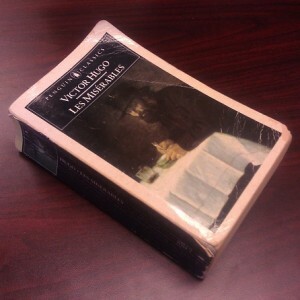 I’m re-reading Victor Hugo’s Les Misérables after 20 years, and providing a running commentary on Twitter at KelsonV @ReadingLesMis. This post is reworked from this week’s comments. Read on, or start with part 1. The Bishop of Digne continues to be the focus of an extended character study, one which also describes conditions in the French countryside in the early 1800s. After chapters of M. Bienvenu seeming perfect, we see him confront his own prejudices as he talks with a dying Revolutionary (as in The French Revolution a generation before) who lives outside of town, shunned by the population as a regicide and probably an atheist. The old man convinces the Bishop of the noble aims of the Revolution, and asks whether the abuses were really worse than the abuses they fought against. Bienvenu comes to respect him even without a miraculous deathbed conversion (he says something about the universe having a self, which must be God, but that’s a long way from standard Christian theology). That’s a much more even-handed treatment of atheism than I expected to find in an 1862 book with heavy religious themes, especially after the snark directed at a materialist a few chapters before. “Without going deeply into matters with which this book is only indirectly concerned…” Why let it stop you this time? He then goes on to rant about the difference between success and merit, and the crowd’s inability to tell them apart. I swear I’ve read this same rant about the Internet, business, and reality television more times than I can count. On page 71, Jean Valjean makes his first appearance as he arrives in Digne. Note that we’re still in “Part 1: Fantine,” and there’s still no sign of her. The costume designer for the movie clearly read this description of him after his release from jail. Two inns kick him out because he’s an ex-convict, so Valjean asks for lodging at the prison. They won’t take him because he’s an ex-con, and tell him he needs to get himself arrested. He ends up in the doghouse — literally — and even the dogs force him out. The bishop’s sister and their servant are arguing over rumors of a dangerous stranger in town, and whether they should bolt the door, when Valjean knocks. Awkward. His reputation having preceded him, Valjean gives up on keeping his status quiet, and blurts out his whole story as soon as he opens the door. After a whole chapter being tight-lipped and vague, everything just tumbles out and he just starts rambling. Come to think of it, everyone the Bishop meets seems to talk at length. He must have that effect on people. And now we get to Valjean’s past as the provider for his widowed sister and her seven children. A bad winter left them with no food, no money, and no work, and that’s when he breaks a windowpane, steals a loaf of bread and gets sentenced to five years hard labor. His sister and her family vanish long before he gets out of prison. He gets one letter, and then nothing. The loss sheds some light on him taking in Cosette. Victor Hugo really wants you to understand Jean Valjean’s state of mind after 19 years in prison — or lack thereof, as it’s basically turned him into a desperate, caged animal. You also get some idea of what Valjean was like before his prison sentence, something missing from the show. Then Hugo shifts gears and starts telling about a ship and a man being swept overboard. It takes a few paragraphs to become clear that this isn’t a POV shift, but a metaphor for what happened to Valjean’s soul when he was abandonded by society. The theft of the silver, almost automatic in the musical, is a tense, suspenseful scene as Valjean wrestles with indecision. It takes Valjean a whole day after he leaves Digne to process what’s happened, finally understanding when he realizes that he’s absent-mindedly stolen a coin from a small boy and that his first impulse is to find him and return it. “…in robbing the boy, he had committed an act of which he was no longer capable.” Valjean went for a long walk, met himself, and realized he didn’t like himself much. At page 118 of Les Misérables, I’ve finished what, in the musical, is the prologue. Whoa. It is like a Wheel of Time book! Update: thoughts from my next read-through. Continue to Part 3 to meet Fantine, Cosette and the Thénardiers. This entry was posted in Book Commentary and tagged Bishop, Candlesticks, Digne, Ephiphany, Jean Valjean, Religion, Revolution, Robbery on February 2, 2013 by Kelson Vibber. I’m enjoying your reviews. It’s been a long time since I’ve read the book (high school). Thanks – I’m glad they’re appreciated! Never read the book, but have enjoyed the musical several times. Thanks for the … well, something more than Cliff’s Notes rendition.